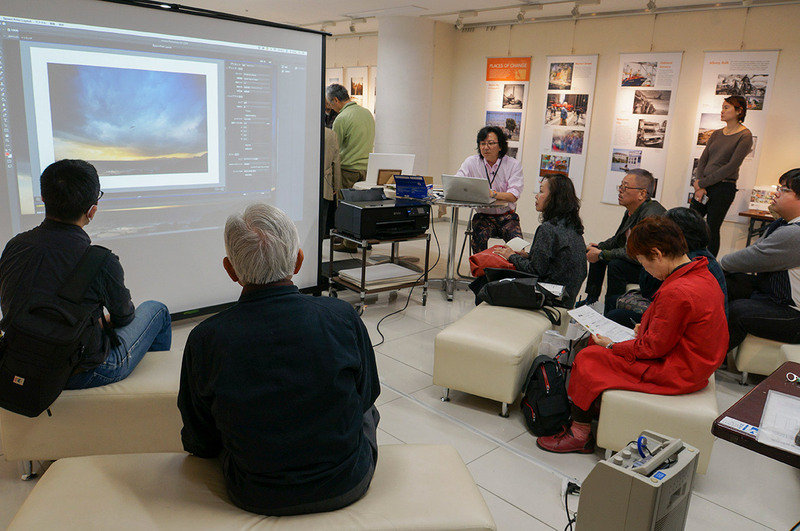 From February 27th to March 4th, SAMURAI FOTO held our 4th Photo Exhibition, “Making a beautiful bridge” at Subway Gallery M in Minatomirai station, Yokohama. 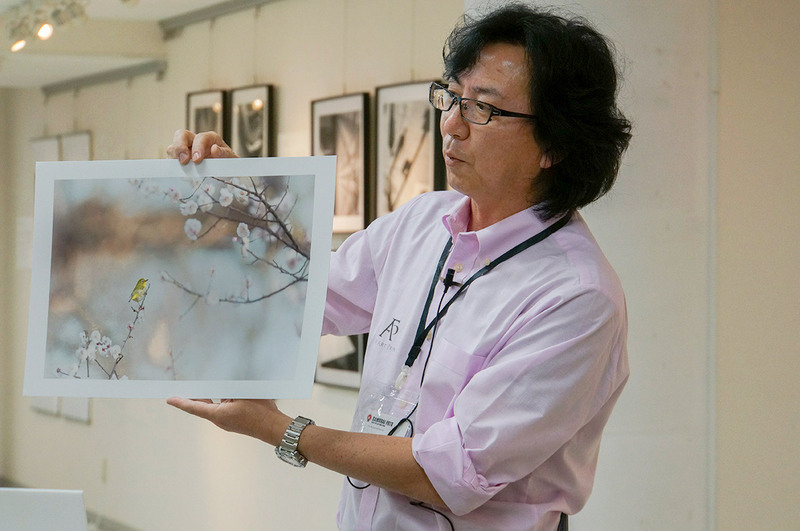 A free seminar by color management specialist, Joji Tomikawa; “Change paper, then picture will change. 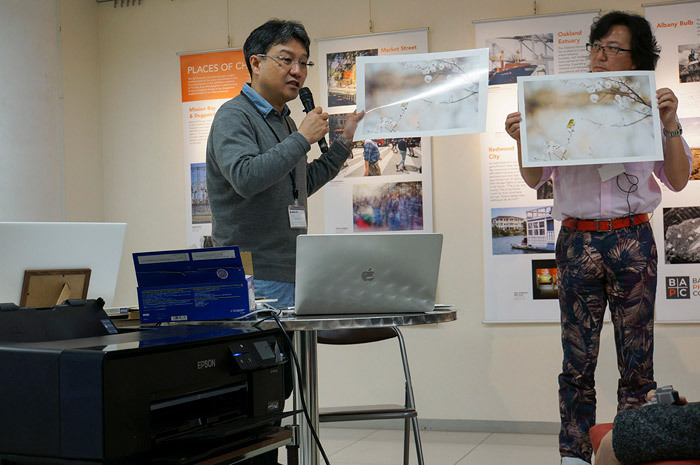 –how to choose a right paper for making an expressive artwork” was held. 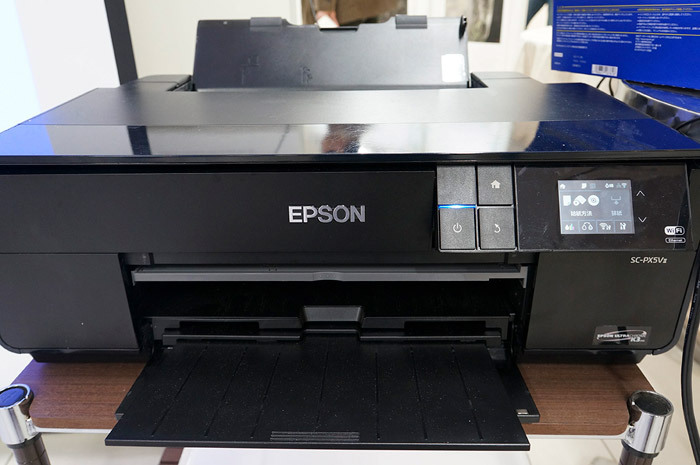 Provided by Epson Sales Co. Ltd.
A glossy paper such as Epson Premium glossy photo paper is good for nightscape photography. But in other cases, matte paper is better because it gives more tender impression. Even it is the same photo, it creates a different impression. 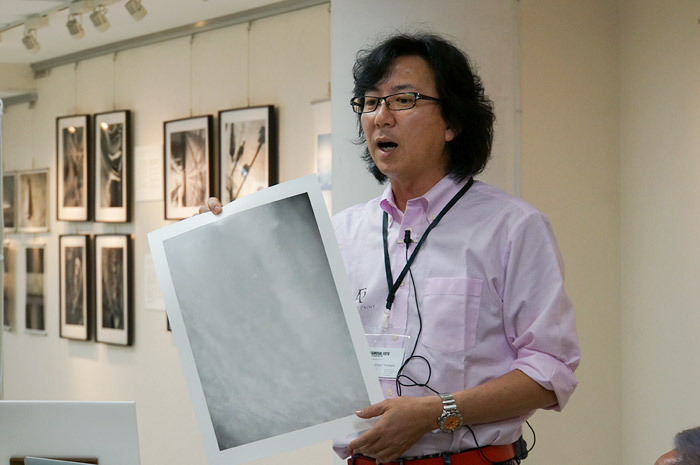 This is a photo of Mr. Sasaki, a member of SAMURAI FOTO. The right photo is printed on glossy paper and the left one is printed on matte paper. You don’t need to worry about the blurry on matte paper. Epson Velvet Fine Art paper produces great color. This is another photo of Mr. Sasaki. This is a close-up shot of dam discharge. 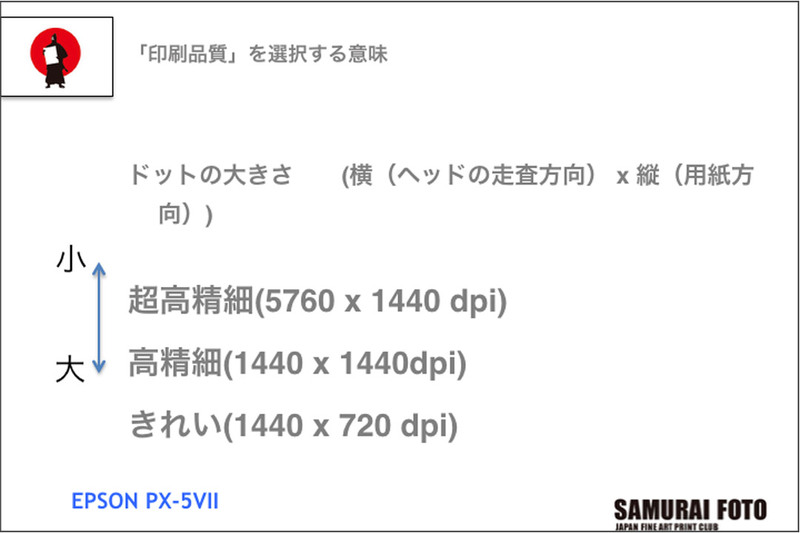 Glossy paper shows the color brightly but it seems flat because of the smooth surface. Matte paper is better suited for this kind of photographs. You can express what you want to show without sacrificing the image quality. Get ICC profiles. You can use the one that is provided by the manufactures or create it by yourself. 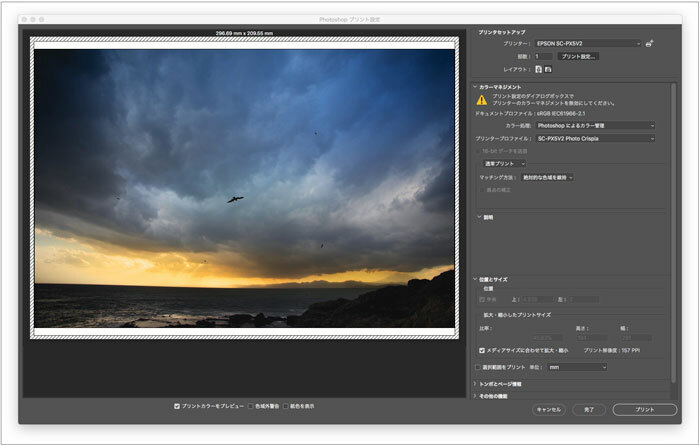 Correct your photo with it and you can print almost the same color as the monitor you see. The printing quality is important. It is ok to set ‘high-definition’ when you use glossy paper but change the printing quality setting to ‘super high-definition’ when you use matte paper. Adjust the Platen Gap settings and thickness of the paper. Put a numeric value. When the quality of the image seems strong, set the platen gap wider. There are 4 kinds of ‘matching’ in ‘conversion options’ and you might wonder which one is the best for your photograph. Tomikawa recommends ‘perception’. It focuses on holding tone of the color. 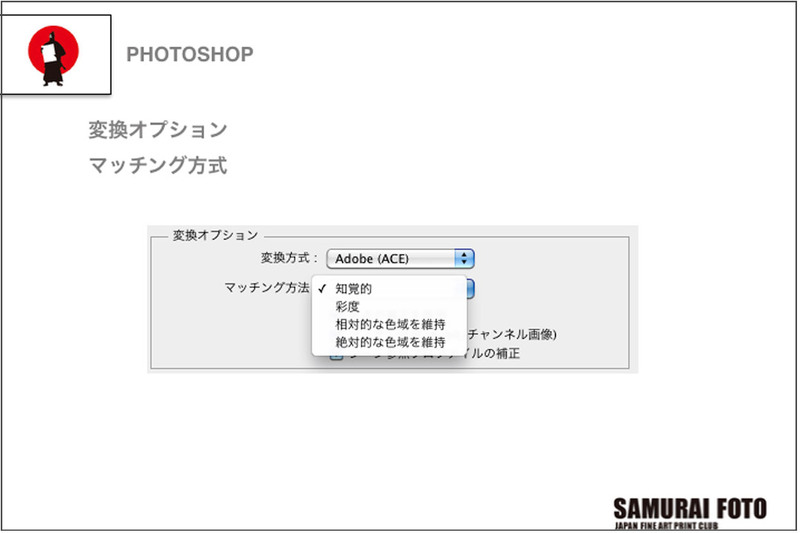 Select ‘Adobe (ACE)’ in ‘conversion method’ in ‘conversion option’. And place a check mark at all section such as ‘use a correction of black spots’ which you see under ‘matching’. 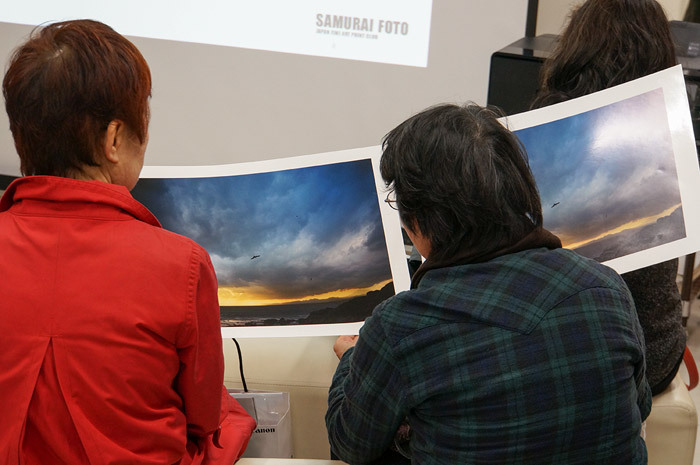 Many of SAMURAI members love to use Epson pro selection printer. This time Tomikawa showed us how to set up a printer with SC-PX5VII. This shows a Photoshop printing settings. (case of Mac computer) In this case, you have to remember the former data of your printing setting. In addition, you have to set the printer as described above. 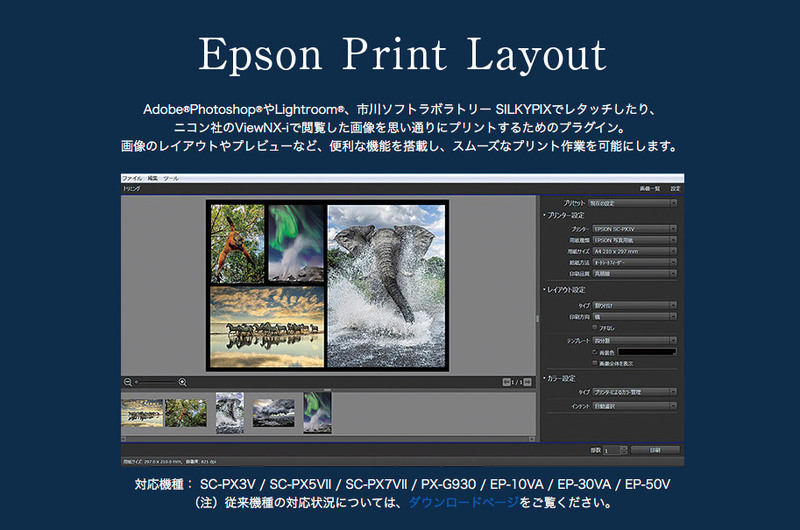 Epson Print Layout is convenient for setting. 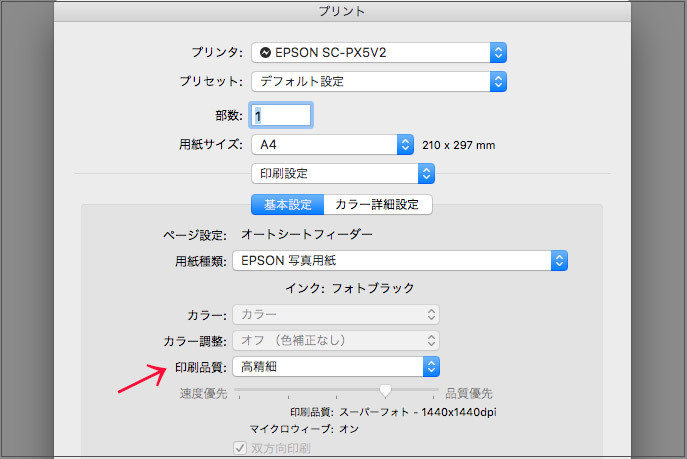 You can go printer directly from Photoshop without using print driver. 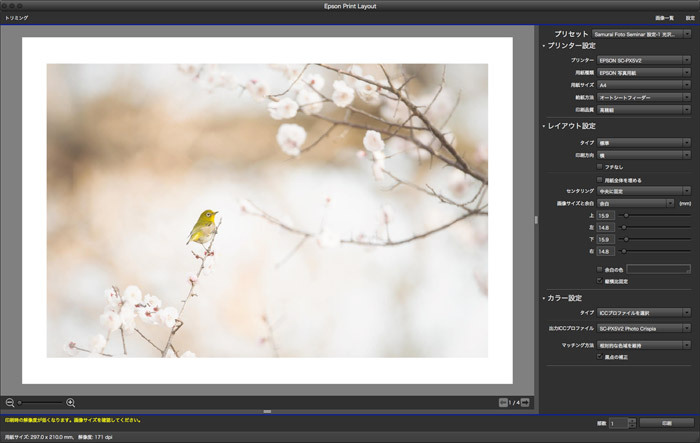 You can download from Epson’s web site. This shows an Epson Print Layout setting. You don’t need another setting for the printer. After downloading, you just go File>automatic processing>Epson Print Layout. You can save the settings. It is very convenient. 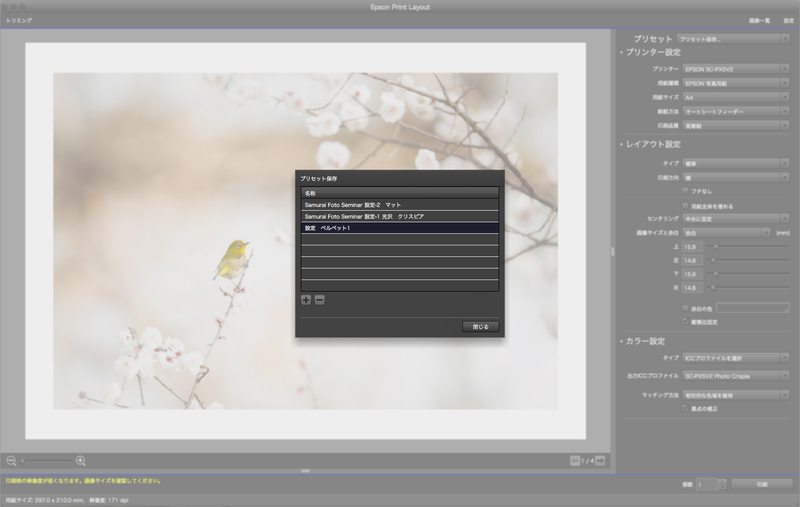 You do ‘Preset saving’ on each paper, you don’t need to do the same setting if you use the same kind of paper. 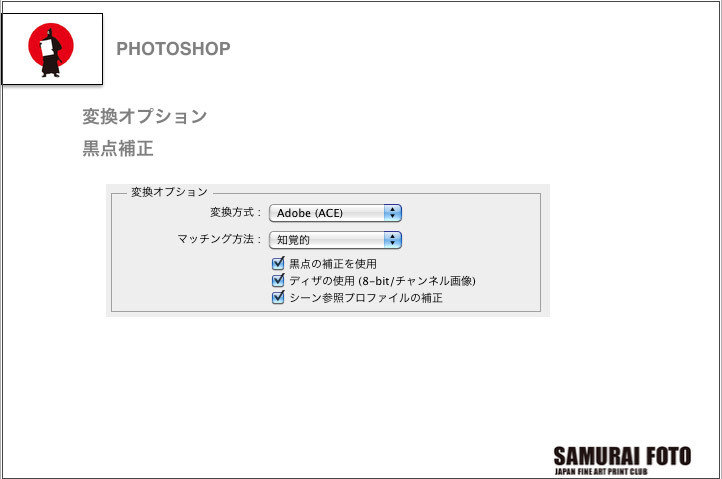 Once you’ve saved the setting, it shows you the type of paper automatically when the photo image is loaded. You just start printing with the printer. 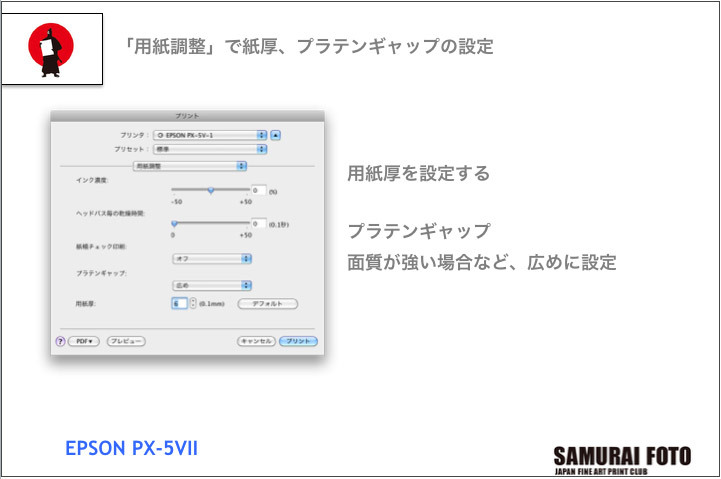 It is easy and can be shortened the time.